Ideally, one should leave a nail salon feeling better than when they arrived and sporting a fresh coat of nail polish. But there’s always the possibility that you might leave with a little something extra -- and no, we’re not talking about a free mint from the check-out desk. Health hazards can sometimes be present in nail salons, quietly lurking amidst the technicians’ tools and the array of nail products. 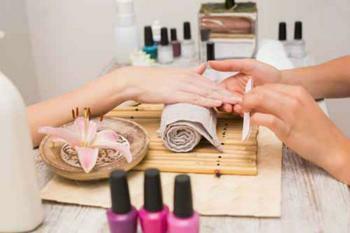 To help you stay on your toes and out of harm’s way, physicians at the Texas A&M Health Science Center explain some of the biggest health risks you could encounter in a nail salon. All the clipping, filing, and cuticle cutting that happens during a manicure or pedicure can be hard on nails. It may even lead to skin lesions. Paronychia -- a bacterial infection of the hard skin surrounding your nail -- is the most common infection caused by skin lesions. Pedicure footbaths may harbor another health risk: a bacterial infection caused by nontuberculous mycobacteria. If you’ve got a skin wound when you dunk your feet into a footbath, you may be at risk of having mycobacteria enter the bloodstream and infect the follicles. To avoid having this happen, experts say it’s best not to shave your legs right before getting a pedicure. Acrylic nails, nail glue, and nail polish can cause allergic contact dermatitis. Contact dermatitis will make itself known through the presence of a rash that appears after exposure to an allergen. To steer clear of contact dermatitis, Texas A&M researchers advise you to be aware of products used at your salon and choose an alternative to acrylic nails. Plantar warts can also develop on the skin following a trip to the nail salon. Similar to how follicular infections develop, plantar warts thrive in warm, moist environments. Cuts in the skin are how they begin. The last stop on the manicure or pedicure journey is often a seat in front of the UV light. But while it might help dry your nails, there can be serious consequences. Although long-term research is needed, dermatologists say UV lights put users at risk of developing skin cancer or tumors. Areas of skin exposed to UV light are also susceptible to aging. Does the nail technician wash his or her hands between clients? Is the sun setting on tanning salons?